Jack McClelland has been one of the most influential poker tournament directors in the game ever since he first earned that title at the 1984 World Series of Poker. After that, he ran the Grand Prix of Poker at the Golden Nugget Casino. He was the first tournament director to host events at Commerce Casino in Southern California, and he has also helped spread tournament poker across the United States and the world, with his international poker tournament résumé including locales like the first tournaments hosted in the Isle of Man, St. Petersburg, Russia, Vienna, Cyprus, and Aruba. For the past 12 years McClelland has run tournaments at Bellagio, where he helped launch some of the earliest events of the World Poker Tour. He was there to kick off the very first event of the WPT in May of 2002. In early December it was announced that he planned to retire after the 2013 WPT Five Diamond Doyle Brunson World Poker Classic. On Friday, Dec. 6 he handled the shuffle-up and deal for his last main event. Card Player caught up with him shortly after cards were in the air to learn more about his retirement and his career. Erik Fast: Can you tell me more about your decision to retire? Jack McClelland: Well, I’ve been doing this for five decades and I’ve got a few health issues. Two weeks after I came to work at the Bellagio the World Poker Tour got its start here, and now they aren’t going to be televising as many events from here so it looked like a good time to retire and take care of my health. EF: Can you tell me a little bit about how you got into poker? JM: My grandmother taught me how to play, starting with two-cent ante, nickel-limit seven-card stud. I was kept broke until I was ten years old because I couldn’t throw a hand away (laughs). But I learned a lot about math playing poker. EF: How did your background in playing poker lead you into a career in gaming? JM: In 1976 my mother started to have health problems, so I moved out to Nevada to help her. She lived five more years. While I was here I wanted to get into the casino business. Back then they didn’t have any dealing schools for poker, so I signed up for a blackjack dealing school. They made up their mind to hire the three pretty girls the first day and just tried to bore the rest of us in to quitting, which I did. At the time I was a semi-professional bowler, playing in a few tour and regional events. I was out bowling at Charleston Heights, which is now Arizona Charlie’s. I ran into a guy who was a dealer at the Sahara and he had me go see his boss and I eventually got hired for $18 a day. After about 18 months I became a shift manager. After the owner passed away they made some changes and I ended up leaving and mostly playing a lot of poker tournaments, playing maybe 400 small buy-in events a year. Eric Drache, who was the director of the WSOP back then and got elected to the Poker Hall of Fame last year, asked me if I’d like to come down and run a shift. So I worked there, and also worked at the Golden Nugget. I was the assistant tournament director, and by two years later I was the director and I’ve been running tournaments ever since. EF: When did you start working as the tournament director here at Bellagio? JM: I started March 15th and about two weeks later, here comes Steve Lipscomb, Mike Sexton, and Lyle Berman and they had this crazy idea for showing hole cards on TV. My partner, the Director of Poker Doug Dalton had handled cash games all of his life, asked me what I thought. I said, “it will work.” So we went to see Bobby Baldwin and he basically just had one question: “will it work?” I said yes, and at the time I thought it might be the shortest job I’d ever held if it didn’t work. So we went ahead, and since I wanted to be different than the World Series of Poker, so I made the championship $25,000 and everybody thought we’d only get 10 players. We got 111 the first year and built it up to 655 before the Internet poker laws changed and the economy crashed. EF: What’s the thing you are most proud of accomplishing in your career as a tournament director? How have you helped change the industry? JM: Back in 1984 you just started a tournament with a quick shuffle up and deal, and as it went along something would come up, someone would try to shoot an angle or something and you’d have to make a ruling. There were thousands of them and one of you and it was hard to stay ahead of them. Since I’ve played and dealt, I understood both sides of the table. I understand the emotion of the players when they lose a big pot or the dealers when a player is throwing cards at them. I came up with the penalty rule to help protect dealers from abuse. There’s not any one specific thing I achieved, but we just tried a lot of small things to make tournaments better. Over my career my two biggest partners were the late Jim Albrecht at the World Series for 15 years and Doug Dalton here for almost 12 years. I’ve also worked for two Poker Hall of Famers in Bobby Baldwin and Jack Binion. EF: You helped bring tournament poker to the Commerce Casino in L.A, and oversaw tournaments at Bellagio, which was the center of the poker world during the boom times. It must feel good to have been able to see such strong results from your work? JM: My late wife passed away about 14 years ago and I was later remarried to my wife Elizabeth, who is from Poland and likes to travel. While I was taking care of my late wife Alma, I took some time off work and when I came back I had to start from the bottom again because everybody that you trained now has the job and they don’t want to give it up. I started doing tournaments in Aruba, Cyprus, London, Vienna, Russia and it took about two years before Doug Dalton contacted me to start some tournaments at Bellagio and, like I said, it wasn’t long after that that Lipscomb and Sexton approached us. Once the WPT hit the TV the following year it was the perfect storm. People at home saw the hole cards and saw Gus Hansen win a million dollars with 9-3 and they thought, well I can play better than that! And then Chris Moneymaker won the WSOP off of $40 and Internet poker allowed people to learn how to play at home. Everything was going great until the online poker laws changed. I’m pretty proud that over 37 years in gaming I’ve never had a gaming violation or employee complaints. If I’ve improved the game of poker any at all over the years by rules or things I’ve done, then I feel like I’ve had a successful career. EF: I heard that the Bellagio had a send off dinner for you recently. How was that? EF: Well I doubt that, but I’m sure you are looking forward to some rest after this event. JM: Looking forward to that, looking forward to playing a little poker. I never played high-limit but I played for 25 years before I got so busy here at Bellagio. I’m looking to play some senior events and maybe play a few big tournaments. EF: It will be fun to be on the other side again and be at a final table while other people have to run it! 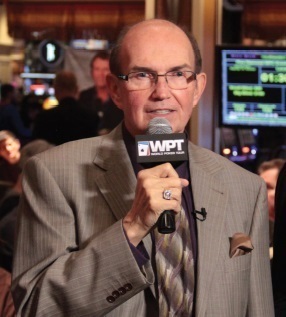 JM: I had fun back in the day the when WPT had another tour called the Professional Poker Tour and they had an event at the Mirage that paid six and only six made the TV final table. I was the bubble boy. EF: Well hopefully you can improve on that result.